Guests of the hotel can enjoy on-site features like a non-smoking hotel with separate smoking areas, meeting facilities, airport transfer, family rooms, free Wi-Fi, air conditioning, private bathrooms with hot/cold showers, and satellite/cable TV. The hotel’s recreational facilities include a fish foot spa, garden, starlight dining, outdoor pool with a separate pool for kids, guided tours, game room, and music rooms. Superb facilities and an excellent location make the Dao Diamond Hotel and Restaurant the perfect base to enjoy your stay in Bohol. This beautiful facility is located on the edge of Tagbilaran City away from the hustle and bustle of downtown. You will get a good night’s sleep in our extra clean rooms. 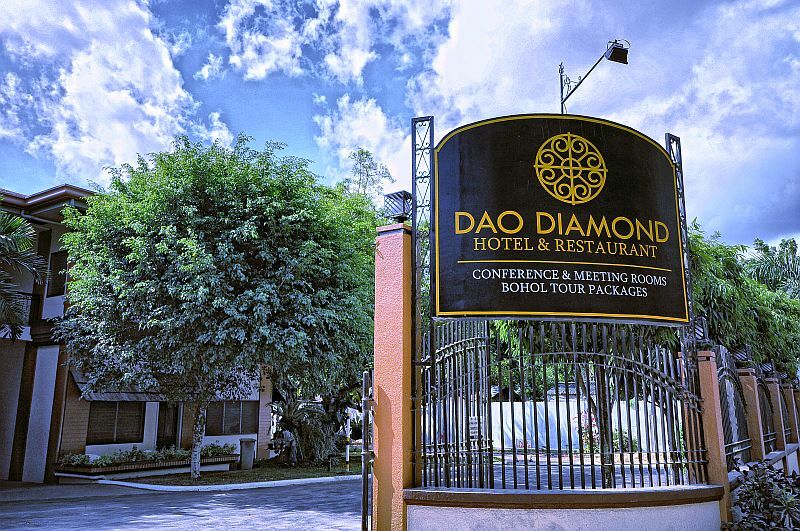 At Dao Diamond Hotel, you have the best of both worlds. Whether you are in a hurry or want to have a leisurely breakfast in the morning, our Chico Café is the perfect place to get your day started. Breakfast is included in the cost of the rooms and we offer a variety of choices from local and international cuisine or create your own omelet at our omelet bar. Located at the back of our Dao Diamond Hotel is an absolutely beautiful dining plaza that is just a great place to spend the evenings listening to music, having a quiet dinner and doing some star gazing. It is easy to see why this little plaza has earned the title as “the most romantic place in town”. After a dusty day of travel, what could be better than to soak your feet in cool water? For a delightfully unique experience place your feet in our Fish Foot Spa and watch as your feet are surrounded by hundreds of little fish nibbling at your toes. If you can handle the tickling of your feet and the idea of fish touching you, then your feet will emerge soft and smooth and will give you a great story to tell. One of the best parts about coming to Bohol is the chance to enjoy the pure white beaches and crystal blue ocean. Just hire one of our vans to take you to the many beaches Panglao has to offer. You can enjoy one of the free beaches or pay a consumable entrance fee to one of the exclusive resorts and enjoy a deluxe beach vacation without the deluxe price. live-in seminars, student study-tours, wedding receptions, family reunions, as well as individual local and international tourist accommodations. Dao Diamond Hotel is famous for its comfortable, clean accommodations and friendly staff. Dao Diamond Hotel and Restaurant is located in Tagbilaran City, Bohol Philippines. We are a Handicap Friendly Hotel and we offer Wheelchair Accessible Rooms. WE NOW ACCEPT PAYPAL AND ALL MAJOR CREDIT CARDS ON-LINE FROM ANY COUNTRY!